Over the last year, the media has done an excellent job of warning the general public of the “imminent” real-estate bubble, comparing this irrational exuberance to the Stock Market Crash of 2000. But an end is nowhere in sight as most regions around the country continue to see double-digit appreciation. People are rushing to buy for fear that rates will increase and that housing prices will keep rising, locking them out of the market. The most obvious red flag analysts will point to is the fact that price appreciation is far surpassing gains in personal incomes. Logic tells us that eventually people will take their money and run. But for the last decade, we have observed a fundamental shift in the amount of debt households have been willing to take on as Americans have leveraged themselves more than anytime in history. Since 1990, interest rates on 30-year mortgages have plummeted from more than 10% to roughly 5.5%. The drop in rates, combined with an approximate 50% rise in national median income, has resulted in a 130% increase in the maximum mortgage that a family with a median income can qualify for. So it only makes sense that home prices in California have increased 131% since 1990. Nationally, home prices are up only 104% over the past 15 years, leading economists to wonder why prices aren’t even higher! In addition, the statistics published by bubble mongers grossly inflate the actual price appreciation taking place. The numbers released by the Office of Federal Housing Enterprise Oversight (OFHEO) only include homes purchased with mortgages below $360,000 that can be bought or backed by Fannie Mae or Freddie Mac. That’s a big distortion, considering that the low end of the market is where most of the speculation takes place. It’s like judging the equity market based solely on penny stocks. Another major flaw is that the OFHEO make no adjustments for property improvements. If I buy a home for $200,000 and later spend $100,000 on renovations, then sell it for $350,000, the entire $150,000 difference would be treated as appreciation! So don’t buy the housing bubble propaganda as normal market forces are driving the current housing boom. Even if prices do eventually fall, people who are looking for a house should not attempt to time the market. 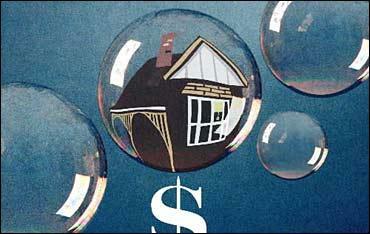 If you plan to live in the same residence for a long time, a potential bubble should never enter into your decision. Otherwise, your timing better be perfect. Remember December 1996, when Alan Greenspan first cautioned stock investors about "irrational exuberance"? The market more than doubled over the next 3 years, and even at the market low, didn’t fall to December 1996 levels. While prices may struggle to keep rising at their current pace, it’s highly doubtful the bubble will burst absent a recession. Most likely, we will see a few more years of considerable gains before leveling-off. Simply put: If it was so obvious that interest rates were going to rise, then rates would already be higher! This post has been tagged and ranked as one of the Quality ‘Housing Bubble’ Posts We-Rank has identified. Totally disagree. Runa search on Net Asset Valuation models and see what you find; and financial markets always regress to the mean. With fundamentals nowhere near property values right now, you may be able to hang on for another year - maybe two - but ultimately, in the long run, the fundamentals must be there. And they aren't. You say Americans are more leveraged than every before - correct. The issue, however, isn't a fundamental shift in consumer purchasing behavior. The issue lies in credit, where the emergence of a new capital markets structure has fundamentally altered how lending takes place. This shift has made it possible for consumers to actually get into loans that no lender would previously ever thought of offering. All it will take is one small thing to send this house of cards to the ground: interest rates over 7%, job losses, appreciation slowing, inflation, energy prices hsooting up, even a change in consumer psyche. Any one of these will have a much greater effect than ever before, because more borrowers than ever before are in a position of risk. Conservative bloggers saluted Defense Secretary Donald Rumsfeld last week after he announced plans for a Freedom Walk on Sept.
Hey, there what a great blog here! I'm definitely going to bookmark you! I have a caribbean vacations site. It pretty much covers caribbean vacations related stuff. Great info dude. I really enjoy reading blogs! I have web conference software site. It really is about web conference software and stuff. Check it out some time.